Prep the stir fry ingredients: Slice the carrot and celery into matchstick-sized strips. Grate the ginger and mince the garlic. Chop the scallions. Break the eggs into a bowl. Soak the noodles according to package instructions, then strain and rinse. Bread the chicken: Fill three bowls with the flour, eggs, and panko, respectively. Heat a thin layer of oil in a frying pan. Slice the chicken into nugget sized chunks, cutting the breasts across the short direction. Salt the nuggets, then dredge in flour, followed by the eggs, then the panko, repeating with each chunk of chicken until you are done. Pan fry the chicken until browned, flipping once. Slice into bite-sized strips. Combine all ingredients and serve in individual bowls. Sometimes fusion food is just plain fun. That's how it is with this Buffalo Chicken Pad Thai. Tasty fun! Let's get one thing out of the way right off the bat. This meal is totally inauthentic. But guess what? It tastes like pad Thai and Buffalo Chicken combined into one amazing noodle dish! It's fun and delicious, so before the backlash begins, remember that if you hate this – it means you hate fun. The idea for this abomination happened when I raided the fridge late on a Saturday night and I put some leftover boneless Buffalo wings into the leftover pad Thai. Thankfully, I had the wherewithal to write down how truly awesome this experience was and set out to make a more thought-out version of it a few days later. When making a quick Asian stir fry like pad Thai, it's important to have all your ingredients prepped and ready before you start cooking. A few quick chicken cutlets enhance that buffalo chicken flavor. Get the stir fry going with carrots and celery first. Carrots and celery are important when you are making Buffalo anything! Then pour the sauce in. This is some fish sauce, sugar, vinegar, lime, and of course, cayenne sauce. At the very end, stir in the scallions, bean sprouts, and chicken. Yummmmmm. 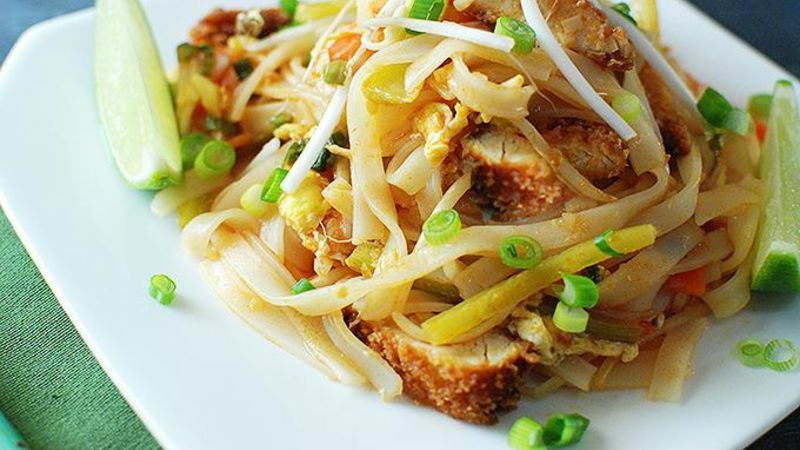 This thing tastes just like you would think – like a bowl of takeout pad Thai with a kick of Buffalo flavor! Dan Whalen pondered his sanity while enjoying this dish. He has been blogging for over 5 years at The Food in My Beard. Check Dan's Tablespoon profile often to try his recipes with creative international spins!